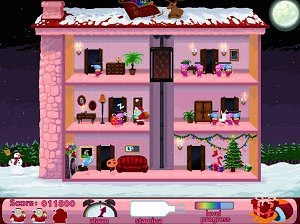 The Night Before Christmas is an original free retro PC game where the aim is to collect gifts and put them under the Christmas tree. However, make sure that not too many kids are sleepwalking in the house – in that case zap them with the Sleepgun – and that you need to take care of your energy by eating milk and cookies. Inspired by classic Mission Elevator, The Night Before Christmas still offers a new take on the genre and is a very funny arcade game to play for a few hours.